Be prepared to raid the piggy bank, but the tonal clarity and voice you'll gain will be worth it. An almost obsessive quest for vintage accuracy. Great balance. Tone is second to none. Jon Gundry formed Throbak to create authentic vintage-style electronics. Products include legendary pedal remakes, plus P-90-style and humbucking pickups. Gundry's goal was to get as close to the original specs and sound as possible. Coming from Grand Rapids, Michigan, with the old Gibson factory just down the road in Kalamazoo and still occupied by Heritage Guitars, Gundry discovered many of Gibson's early suppliers were still around. "The alloys for the magnets, baseplates, covers and screws are made with the closest materials possible to the originals"
He soon had them making pickup parts for him. So the alloys for the magnets, baseplates, covers and screws, the wire, and the plastic for the bobbins and surrounds are made with the closest materials possible to the originals. Gundry also acquired an original Leesona 102 pickup winding machine, as used by Gibson through its 'golden era'. Then, unbelievably, on a visit to Heritage he discovered the Gibson-designed 'Slug 101' winder still there; he purchased it and has been using both machines to create his pickups ever since. Collings now offers ThroBaks as options on its electric guitars and the company's UK distributor, Guitar XS, is handling the pickups, too. We have an MXV-loaded Collings City Limits Deluxe to try - our first meeting with ThroBaks. "The Custom ER MXV PAF set is a collaboration between Jon Gundry and trusted Collings associate Ed Reynolds - the 'ER'. They are wound on the Leesona 102 and are rich in the double tones and dynamics associated with the best of vintage 50s PAFs. They are wound to 7.9k ohms in the neck and 8.3k in the bridge and offer a fat tone with focused mids and harmonically rich high end. They have a wonderful vowel-like vocal dynamic to the picked note." Hmm... sounds like a pickup we might enjoy! "String-to-string and pickup-to-pickup balance are simply superb"
To remind us of the Gibson sound, we had a '73 Les Paul Custom to hand. Through a Vox AC-15HW, the Collings' clean tone is articulate and clear, compared to the faintly indistinct voice of the Gibson. Collings builds its guitars to the most exacting standards and a pickup can only amplify what it hears. So we must factor this into the equation. We can hear a definite high-mid character, too, compared with the bassier tone of the Gibson. This is the 'vocal' or 'vowel-y' quality to which Collings alludes. Kicking in a Providence Sonic Drive, that high-mid vowel sound instantly speaks. Check out David Grissom's tone: it's that ballpark in which the ThroBaks sit - harmonic overtones aplenty, sustain to die for but clarity and dynamics winning over mush every time. String-to-string and pickup-to-pickup balance are simply superb, all adding to the dynamics and articulation. 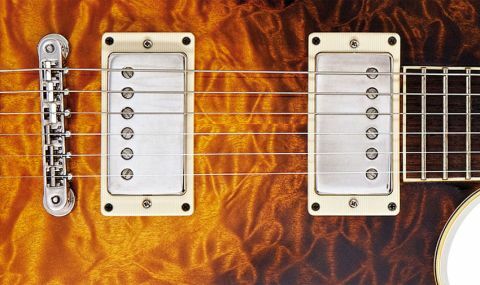 The Collings with ER-voiced MXV pickups is a soloist's dream. Our Gibson is a great sounding guitar, but here everything is more focused, refined and classy. Now we need to try a regular set of ThroBaks in the Custom - we'll keep you posted!